So this is the day after. When I awoke this morning pining for some food, abba came to get me, which was odd since it is usually mommy. And he brought me to mommy - in bed. I'm noticing a pattern - mommy isn't walking much today. My legs feel just fine after the big marathon yesterday, so I don't understand what is ailing her. Me crossing the finish line with mommy and Anna!! That fake grass that we ran on to the finish line was deluged upon the previous night as all the rain left in the sky poured down upon Jerusalem. Mommy said it was like running on a water bed, the hardest part of the course! Or Barry and Alisha who waited HOURS for mommy to finish the race and welcomed us at the end of the line? (Barry ran the 10K and Alisha walked the entire city beforehand to find mommy along the way and cheer her on.) Or Jason who ran an extra half marathon (which makes a full) just to find us on the course and coordinate the photo-finish ending? Or Susanna, Shiri and Bethany and all their children who inspired us at the halfway point? Or Nadia who also found us along the way and promised "shana haba b'Yerushalayim" - next year in Jerusalem!? Or Anna, our new BFF, who ran the entire race with mommy with an endless supply of energy and exhortation? Or abba who juggled my whole morning routine alone, traversed the entire city with me and traipsed through mud puddles to arrive at the finish line as the most supportive husband and father EVER? Or all of you who were with us in spirit and with your encouraging comments and posts and prayers? Or those of you who continued to give to Shalva on behalf of our run even while the race was going on? That was just amazing and I'm sure it telepathically inspired mommy as she ran. Ok, I think I just unwittingly covered most of the shout outs. I'm sure I'll think of many more as the day goes on, but seriously, we could not have run this alone and we are every so grateful for all the support. It was scenes like this, so frequently appearing along our route, that renewed our vigor and determination as we took part in the first ever Jerusalem Marathon on March 25, 2011. 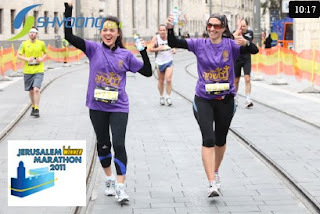 Anna, from New York, was - along with me - running her first marathon. This was her second time in Israel, her first in more than a decade. I live here and see many of these views every day (the course even went by my apartment! ), but Anna’s unfettered enthusiasm helped me to see these dazzling landscapes as if for the first time. The streets were swept clear of the traffic that marks modern Israel and laid bare the ancient stones that are always there, but easy to miss in the daily bustle of the city. The setting of Jerusalem distinguished this race from every other in the world. While Jerusalem is arguably the most difficult city marathons worldwide, it is also probably one of the most beautiful courses and definitely the most unique. We spanned 5,000 years of history over this 42-kilometer course. From the Knesset, the seat of Israel’s modern government, to Mount Zion, the seat of Israel’s ancient government, to the United Nations headquarters, and promenades from both southern and northern vantage points, we had an unparalleled tour of the city, its mountains, valleys and the residents that came out to cheer us along. During the course we heard snippets of several languages - Italian, French, German, Portuguese and Polish, to name a few. A South African team ran together. Elite runners, most of them from Kenya and Ethiopia, led the pack. 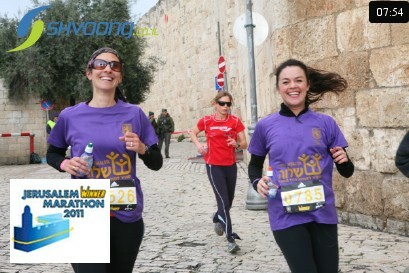 Long-time Jerusalem runners likened the city’s first marathon to going to their daughter’s wedding - the excitement was that high and the preparations that intense leading up to the big day. Many multi-marathon runners ascended to the city for this race (there were 10,000 participants total in three races: the full 42 kilometers, the half marathon and a 10-km race), and many of them were shocked at how difficult the course proved to be. Two Italian runners circling Hebrew University with Anna and me told us that this was by far the most difficult city marathon they had run due to Jerusalem’s hills, but the stunning views made it worth it, they said. Punch drunk at 30k on Jaffa Road. No they are NOT walking. Another pair of runners, brothers from the U.S. who have run the New York City Marathon multiple times, agreed that the Jerusalem race was an emotional and spiritual experience, virtually connecting them to the land. Besides training, I had prepared for this course by finding some inspirational quotes to spur me along. And naturally the most apt words were from the Bible, written in this very land. “With my God I can scale a wall.” Psalm 18:29 - to help me deal with the infamous “wall” that plagues marathon runners usually at the 20th mile. Then there was this gem (my paraphrase): “Who do you think you are O mighty mountain? Before (me) you shall become flat ground!” Zechariah 4:7 - my retort to the hundreds of inclines, hills and outright mountains we encountered. He may have succeeded. The race was a hit among many of the runners with whom I spoke. Barkat, a multi-marathoner himself, ran the half marathon this year, but hopes to run the full next year, already on the calendar for March 16, 2012. Anna and I didn’t run to set any records, but we were running soul mates from the outset with the same pace and same goals: to survive, to beat five hours and to thoroughly enjoy ourselves while doing so. And in the end, 42 kilometers later, all goals achieved, we finished the race with huge smiles on our faces, smiles that miraculously never waned during (and despite) 42 kilometers. The city never let us down. Now the question is, I feel good enough for my day at Shalva tomorrow, but will mommy? Congratulations Nicole and thank you Daniel for your support. And let's not forget to acknowledge that great abba and husband!